In the United States (US), the degree to which federal law has encroached on international research and academic communications is not widely known or understood. Despite this, a web of legal code, statutes, executive orders, and intersecting agency jurisdictions apply to all US researchers, with stiff civil and criminal penalties for those who transgress. As the transfer of knowledge is considered an export by the US government, and Title 31 code of federal regulations 500–599 applies to research collaboration, teaching, presenting, publishing, and other activities. Collaboration with persons or institutions in sanctioned entities (e.g., Cuba, North Korea, Iran, Syria, and others) requires approval by the Office of Foreign Assets Control (OFAC). Original investigations, meta-analyses, reviews, and case reports/series performed with designated entities also requires OFAC approval. Other types of academic output are more case specific. Opinion pieces may be exempted, but still require OFAC review, as do professional conversations and translation services. Peer review performed as part of routine journal editing or peer review panel is acceptable if the work is not otherwise export controlled. Editing an individual's work outside of these avenues always requires approval. Noncompliance with federal regulations may yield criminal penalties up to $1,000,000 USD and/or 20 years in prison (per violation). The US investigators must be informed of these regulations to prevent inadvertent legal transgressions and repercussions. Acute respiratory distress syndrome (ARDS) is a life-threatening disease. Different imaging techniques have been used to diagnose and guide the ventilatory management of patients with ARDS. 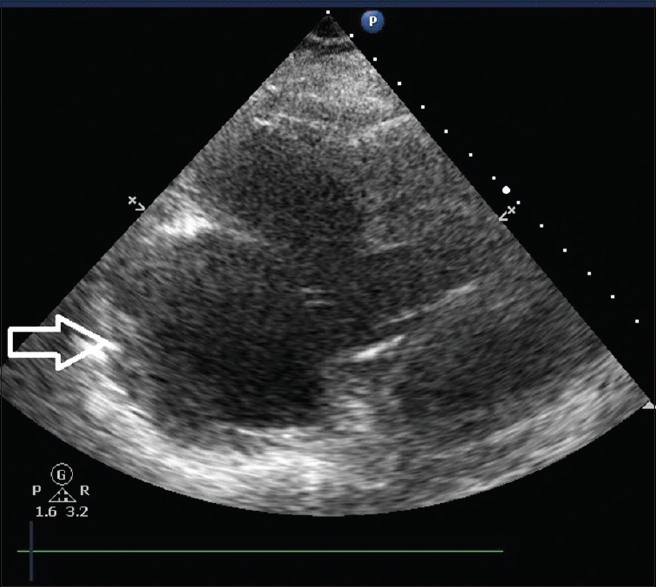 Chest ultrasound is a reliable tool to identify interstitial syndrome, lung consolidation, lung collapse, and pleural effusion. In addition, echocardiography is essential in the diagnosis of diastolic left ventricle dysfunction and the estimation of elevated ventricle filling pressures, which is necessary before diagnosing ARDS. Therefore, combining chest and heart ultrasound assessment is useful to diagnose ARDS and guide the ventilatory management of the disease. Available data in the literature suggest that protocol-based approaches should be implemented for the purposes of diagnosis and management. 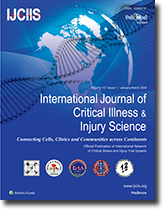 Aims: This study aims to study the incidence, microbiological and antibiotic sensitivity and resistance profile and impact on intensive care units (ICUs) stay and mortality of nosocomial infections in patients admitted to surgical ICU of our hospital. Methods: A retrospective analysis of all patients admitted, over the course of 1 year, in the surgical ICU was undertaken. All patients who developed nosocomial infections were included in the study. Incidence, sites, common organisms of nosocomial infection were identified. The antibiotic sensitivity pattern of the microorganisms which were cultured was identified. This group of patients with nosocomial infections was matched with group of patients without nosocomial infections with respect to age, gender, and clinical diagnosis and the impact of nosocomial infections on ICU stay, and mortality was studied. Results: Of 1051 patients admitted to the ICU during the study, 350 patients developed nosocomial infections and were included in the study group. Of the remaining patients, 350 patients matching the patients in the study group were included in the control group. The prevalence of nosocomial infections in our study was 33.30%. Skin and soft tissue infections (36.30%), including postoperative wound infections were the most common nosocomial infection, followed by respiratory infections (24.46%) and genitourinary infections (23.40%). The most common organisms causing nosocomial infections were Escherichia coli (26.59%) and Acinetobacter species (18.08%). About 40% of all Gram-negative organisms isolated were multidrug resistant. The average length of stay in ICU was 14.4 days for patients with nosocomial infections and 5.4 days (P < 0.05) for matched patients without nosocomial infections. The mortality in patients with nosocomial infections was 25.14% while that in patients without nosocomial infections was 10.57% (P < 0.05). Overall ICU mortality was 14.27%. Conclusions: Nosocomial infections in surgical ICU patients significantly increase ICU length of stay and mortality. Objective: We sought out to determine the correlation between the injury severity score (ISS) and multiple organ dysfunction syndrome (MODS) between severely injured young adults (18–54 years) and elderly (>55 years) patients. Materials and Methods: This was a cross-sectional observational study. We included all adult cases (>18 years) diagnosed with trauma defined by the International Classification of Diseases, Ninth Revision. For significance testing, Chi-square test and odds ratio were used. Severe injuries were defined by an ISS >15. The presence of MODS was based on the definitions proposed by society for critical care medicine. Results: A total of 469 young and 173 elderly patients were included in the study. 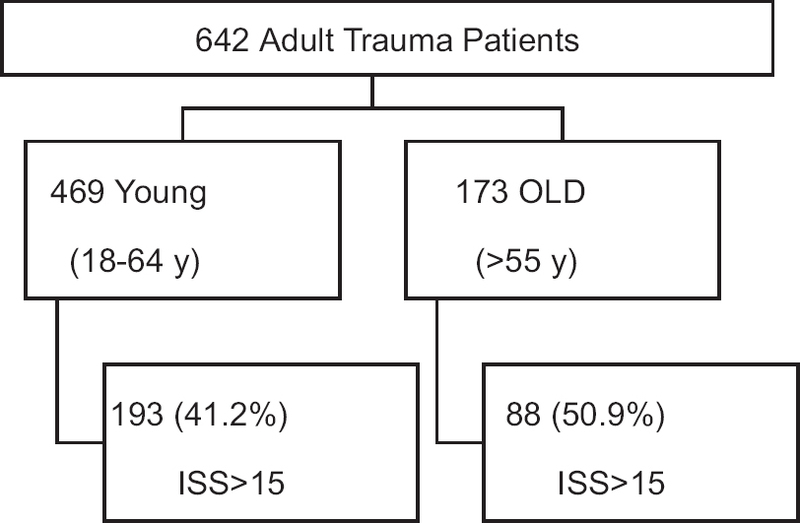 Among the 469 young adults, 193 had ISS >15, whereas out of the 173 elderly patients, 88 had an ISS >15. Severely injured young and elderly groups were more likely to develop MODS compared with those with an ISS <15 (P < 0.001 and P < 0.001, respectively). The elderly had a higher likelihood of developing MODS (P < 0.001; odds ratio: 5.17; 95% confidence interval: 2.74–9.80). Conclusion: This study demonstrated a direct relationship between an ISS >15 and the development of MODS. We also observed a five-fold increase in the development of MODS among severely injured elderly patients. Background: A study was conducted in 2013 on the lack of accurate statistics on the environmental and family factors behind the use of drugs by drivers of public transport. Materials and Methods: Overall, 1176 drivers of buses, mini-buses, vans, all kinds of trucks, and cars were randomly selected proportionately according to the type of vehicles. The capture-recapture sampling method was used to determine the prevalence rate of drug use among commercial drivers. Trained experts collected data regarding the environmental and family factors behind the use of addictive drugs. Urinalysis was performed by the Rapid Test method (ACON, San Diego, USA). To providing descriptive and analytical statistics the Kruskal–Wallis and Mantel–Haenszel methods, logistic regression, and Chi-square tests were used. Results: The mean age of the drivers was 39.9 ± 9.7 years. The results of the experiment were positive in 14.1% of the drivers. A significant difference observed between addicted and nonaddicted drivers related to cold and heat (P < 0.001) and lack of facilities (P = 0.006) as the most influencing factors. The most important environmental factor was family poverty (P < 0.001), followed by marital status and its problems (P = 0.002), a large number of children (P = 0.006), and family disputes (P = 0.012). A family history of addiction was 2.5 times more among addicted drivers. Conclusion: Prevalence of addiction was 14.1%. Among the environmental factors, cold and heat, lack of facilities, family factors, and a family history of addiction greatly influenced addiction. Background: Previous studies suggest that various factors including the type of occupation, employment status, and level of education have significant associations with the rates of occupational injuries. The aim of this study was to assess the impact of demographics, such as age and gender, and various occupational factors on the rate of occupational injuries for a 14-year period from 2001 to 2014 and to study the differences in trends over time. Methods: The Canadian Community Health Survey data for 2001, 2003, 2005, 2007, and 2009–2014 was used to examine the impact of various occupational factors on workplace injuries in the Canadian population. Various inclusion criteria such as age, employment type, and status were applied to select the final sample. The logistic regression was performed using StataMP 11 to determine the association between the rate of occupational injuries and the factors being considered. Results: Rates of injuries occurring at the workplace are associated with various occupational health factors, including, the type of occupation, level of education, the number of injuries sustained, and the employment status. Conclusion: The findings may be used by researchers and practitioners to address the impact of occupational injuries in the workforce, and to identify and resolve the factors that result in a high rate of workplace injuries. Introduction: Noninvasive ventilation (NIV) has emerged as an important tool for the management of acute hypoxic respiratory failure (AHRF) and has been the area of research in the last two decades. In this study, we have tried to find out the outcome of NIV in patients with AHRF. Materials and Methods: In this prospective, observational study, all the patients of AHRF requiring NIV were enrolled, and heart rate (HR), respiratory rate (RR), arterial blood gas parameters, and NIV settings at baseline, 1 h, and 4 h were collected. The patients were classified as AHRF with acute respiratory distress syndrome (ARDS) and AHRF without ARDS, which were further classified according to the outcome. Results: Among 200 patients admitted in medical intensive care unit (ICU), 50 patients (27 with ARDS and 23 without ARDS) were put on NIV. There was a significant improvement in HR, RR, PaO2, and inspiratory positive airway pressure after 1 and 4 h and significant improvement at 4 h in expiratory positive airway pressure in all the groups on NIV. Length of ICU stay and hospital stay was less in the nonintubated group. Mortality rate was 25.92% in the intubated group, while it was nil in the nonintubated group. 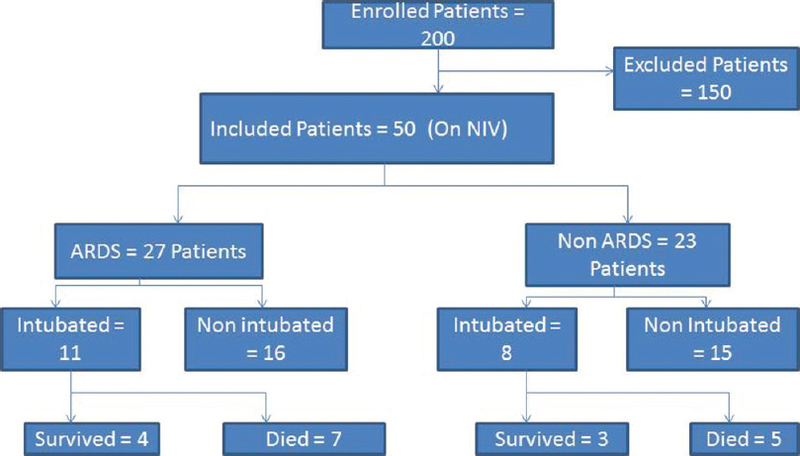 Conclusion: NIV found to reduce the endotracheal intubation and mortality, by improving the outcome of the patient. Left ventricular (LV) pseudoaneurysm is a rare and grave complication of acute myocardial infarction. If left undetected, it has an extremely high rate of mortality. It is complicated by a ventricular free wall rupture contained by the pericardium and is characterized by the absence of myocardial tissue in its wall. The clinical presentation of these patients is nonspecific, making the diagnosis challenging. We came across a case of LV pseudoaneurysm diagnosed by transthoracic echocardiography, but unfortunately, the patient passed away within a few hours of presentation in the emergency department. This case depicts the importance of prompt diagnosis and management of such deadly complication. Nail guns are cheap and easy-to-access devices that are common in the industry and personal use and are widely used by untrained people. Life-threatening injuries may occur after a self-accident due to the use of these devices. 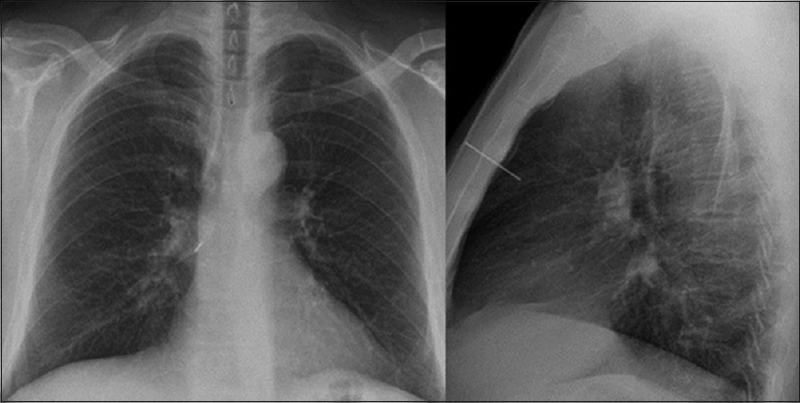 We report the case of a 47-year-old man who had hemoptysis due to a lung parenchymal injury after nail gun use. Computed tomography revealed focal alveolar hemorrhage. Hemodynamically stable, the patient underwent surgery. Nail guns penetrating the chest can cause life-threatening situations. In the emergency department, rapid diagnosis and treatment is vital in preventing fatal outcome.